Wake on LAN from S5 (power-off) state on systems that include an Intel LAN / Ethernet Controller may require operating system configuration so that the system wakes up when a magic packet is sent to the adapter. Install the latest tested driver from the Stone Driver Finder or the motherboard manufacturer's web site. IMPORTANT: Please ensure that you install the full driver package, not just the base driver. The base driver does not give you access to additional features installed by the full package. 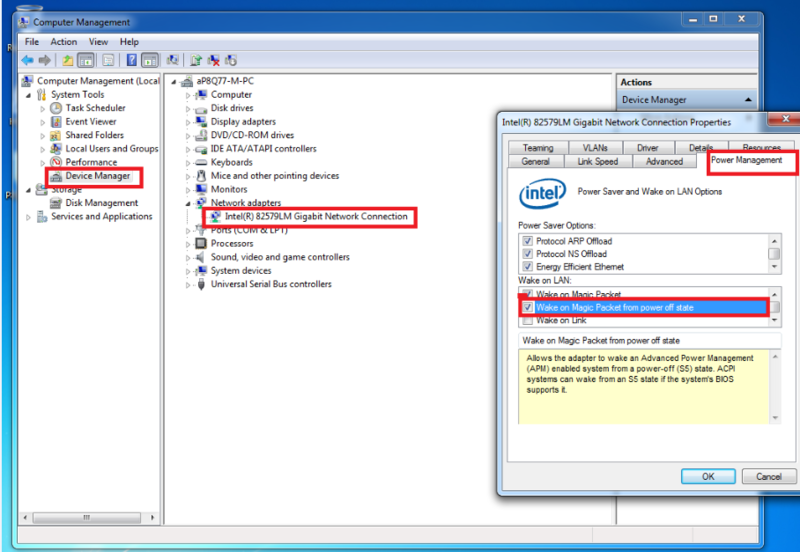 Enable the following setting in the LAN controller’s properties within Windows; ‘Wake on Magic Packet from power off state’ as shown in the image below. Note: Some laptop models do not support Wake on LAN from S5 while the lid is closed. Please test the required functionality in your development environment. In addition to Windows 10 requiring that fast start-up is turned off in order to support WOL, please note that some Intel LAN controllers do not have an official Windows 10 driver available from Intel. Some controllers such as the 82574L are only supported by the Windows 10 "inbox" driver. Most of these inbox drivers do not support WOL functionality. This means that a system that has an 82574L and supported WOL on Windows 7 or Windows 8.x may not support WOL on Windows 10.